A recent, esteemed guest on a national radio program said that it was time for people to grow up by stop believing in God. The prophet has something to say to such people and to those who put them on the public airwaves. “Woe!” When a people will listen to no voice but their own, when they refuse to draw near to God, “Woe!” That people will tear themselves apart. Yet God will continue to be faithful. With each rising sun, he awaits people’s repentance. It does not come—at least en masse. God’s angels pour out measures of wrath but remarkably, people will still not repent. Yet God in his patience, sees his invisible kingdom is surely and gradually growing year by year throughout the millennia. While there is still time, let us not occupy ourselves with reports from wise guys. Listen to the voice that matters. 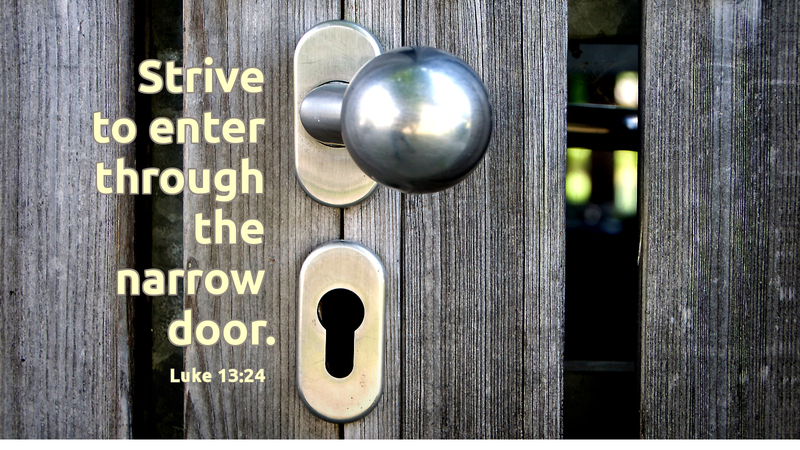 God still calls out for people to enter through the narrowing door, for the time is drawing near; the door is closing. Put your hope in Jesus, the door of heaven. Enter his kingdom now before the door is shut. Prayer: May my focus be you, Lord. Amen.